Pápai Páriz Ferenc, Album amicorum p. 91. Spera, fide DEO coronabit laurea finem! When this you see remember mee. Your moste affectionate friend and faithfull Servant. For another version of the same motto, cf. the note of Michael Theophil Bauer on p. 95. Hope and believe in God, at the end you will be crowned with laurel! 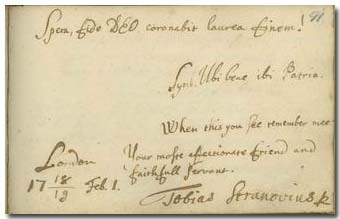 Tobias Stranover (Stranovius) was born in Nagyszeben (Sibiu) in 1684, a son of the local painter Jeremias Stranover (?-1702). His elder brother, Jeremias Stranover (?-?) was also a painter in Nagyszeben, just like his father-in-law, Jakab Bogdány (c. 1660-1724). He was baptized on October 7. He learned with his father-in-law in London, then he worked in the Netherlands, Hamburg, Dresden, Nagyszeben and London. He died on February 26, 1756, most probably in London. He painted very popular still lives of fruits and animals in the style of his father-in-law. His works are kept in the Kunsthalle of Hamburg, the Landesmuseum of Schwerin, and several other German collections, as well as the Brukenthal Museum of Nagyszeben. Two of his paintings can be seen in the Museum of Fine Arts in Budapest. According to most lexicons Tobias Stranovius died after 1724, while others suppose him to have died after 1731. However, he is mentioned as being in life in 1733 by his brother-in-law William Bogdani. On p. 396 of vol. 25 (1756) of the London Magazine a laudatory poem dedicated to him mentions the exact date of his death: February 26, 1756 [Gömöri: Lord Paget].